Look around any office and you'll likely find workers wearing wrist splints to help them deal with carpal tunnel syndrome, the painful condition that's often linked to too much time at the keyboard. Many patients resort to surgery to get relief, but a new study conducted in Spain and the United States finds that physical therapy is just as effective as surgery. Researchers report that one year following treatment, patients with carpal tunnel syndrome who received physical therapy achieved results comparable to outcomes for patients who had surgery -- and physical therapy patients saw faster improvements at the one-month mark than did patients treated surgically. The syndrome results from repetitive motions, like typing and assembly-line work. 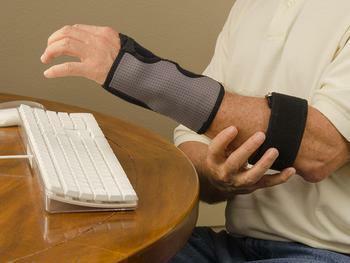 It causes pain, numbness, and weakness in the wrist and hand and is linked to nearly half of all work-related injuries. Although surgery may be considered when the symptoms are severe, more than a third of patients do not return to work within eight weeks after the operation. The study demonstrates that physical therapy -- particularly a combination of manual therapy of the neck and median nerve and stretching exercises -- may be preferable to surgery, certainly as a starting point for treatment. "Conservative treatment may be an intervention option for patients with carpal tunnel syndrome as a first line of management prior to or instead of surgery," says lead author César Fernández de las Peñas, PT, PhD, DMSc, with the Department of Physical Therapy, Occupational Therapy, Rehabilitation, and Physical Medicine at Universidad Rey Juan Carlos, Alcorcón, Spain. The full study is published in the Journal of Orthopaedic & Sports Physical Therapy. Editor's note: This story summarizes a recent healthcare study. Many such studies are conducted each year and some may reach different conclusions. A single study does not form the basis for changing the course of treatment. You should not make any decisions solely on the basis of this or any other news story, advertisement, or social media posting. Only your physician can advise you.